Woo Hoo! We made it to Christmas break. That's the feeling of everyone around our house. The last assignment of the semester has been turned in and I might even grade it all so that I can issue a report card before Christmas. I still can't fathom that 6th grade is halfway complete. We ended up taking two days off during our last week of school. I want to feel pathetic, but when I look at the various reports in my homeschool tracking software I see that we are well over halfway finished with school for the year and Amber has done more work than anyone would expect given how sick she has been. So, instead of feeling pathetic I'm proud of Amber to have been so diligent in her school work. Looky! I took recital pictures. (LEFT) Contemporary dance. I was working the dressing room so I didn't have prime photo opportunities, I barely saw Amber's dances. 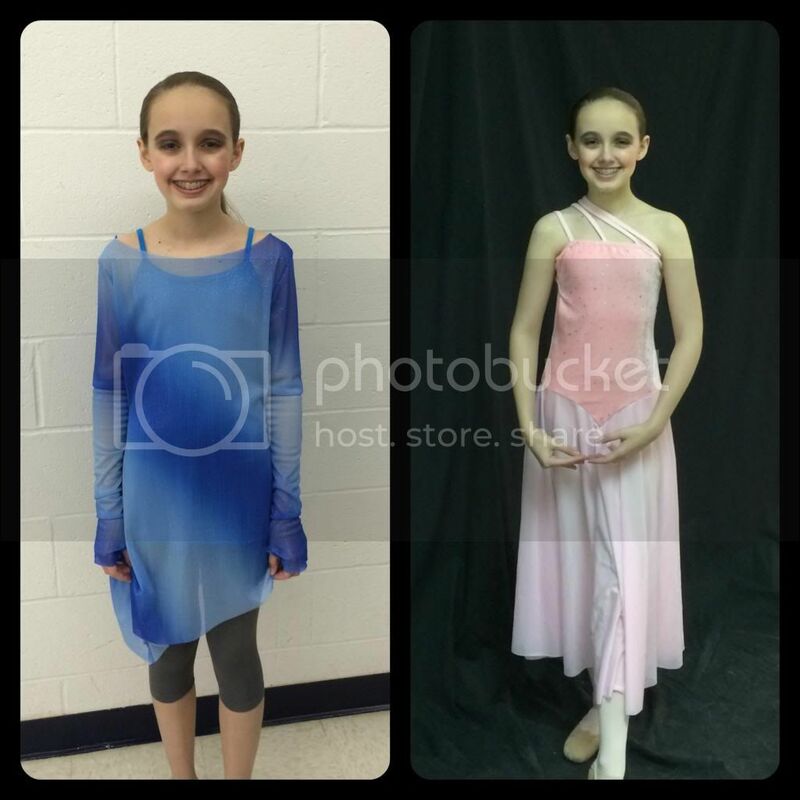 (RIGHT) Ballet costume. Amber hates this one. It matters not your size, nobody looks good in this outfit. Unfortunately, ballet 3 wears it every recital and ballet 4 wears the same one in black. Even Amber at her 15.4 BMI and 10th percentile weight doesn't look her best. Tuesday we took a day off for appointments. Amber had the orthodontist first and it appears she is definitely approaching the end. Her next appointment is much sooner than normal. Second, Amber had the endocrinologist who is testing Amber's thyroid, again. It all looks good, excepting the slightly off kilter thyroid results. Lastly, I had to take Fred to Barnes to begin his genetic testing because of the pheochromocytoma he had last year. Hopefully, his was a random occurrence and not from an altered gene. Yesterday Amber "hosted" a Christmas party for a couple of friends. Because of the multitude of cats (3) that now inhabit our house, we decided it might be best for the party be an activity outside of our house. We started out with lunch and dessert at Longhorn for the girls. Our family eats at this location regularly, so they were just fine with me bringing fructose free dessert for Amber. Then, we moved on to bumper bowling. It's just more fun when you can actually hit the pins. The last game Amber surprised us all with her mad bowling skills. 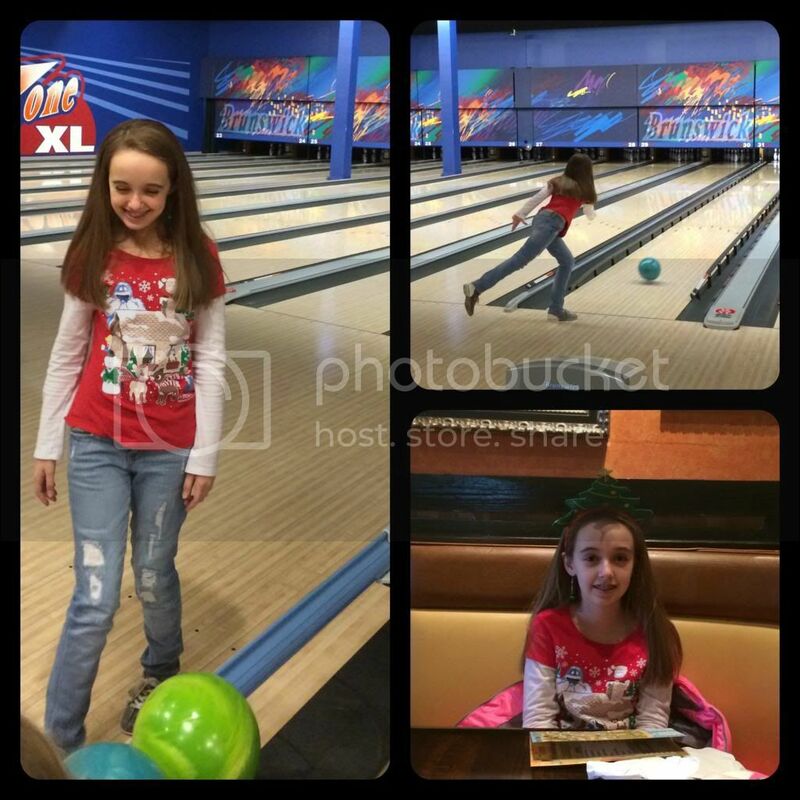 She scored 5 spares (all the result of a 9 pin initial throw, then 1 pin second throw) and rarely hit the bumpers. We aren't sure where that sudden ability came from, but she was very happy to finally win a game. (RIGHT-TOP) Look at her go! In all this week Amber managed to wrap up the current literature book, a grammar chapter, her Fructose Malabsorption unit, and the current logic curriculum. In January we will be starting fresh with a new curriculum in science and logic. It's almost like starting a new school year with much being fresh and untried. At some point I need to write reviews for all the curriculum that we have completed this semester. I rarely buy curriculum without reading reviews first - many, many reviews. I figure the least that I can do is return the favor for others looking at the same curriculum. Perhaps I can accomplish that during Christmas break, you know the same way I've managed to address the Christmas cards that are still sitting on my desk. Math keeps plodding along and Amber will actually be working on math over Christmas break. There was an attitude problem at the beginning of the week that resulted in some choices for Amber. She chose to do daily math assignments for most of Christmas break to demonstrate her change in attitude. This may or may not work out because I don't see me actually being motivated to go over math lessons with her. Next week we are baking sugar cookies with Grandma, even though Amber can't eat any of those particular cookies. We are also going to try a variety of low fructose sugar cookies here at home. We haven't tried any new foods this week, except stevia in Amber's decaf iced tea. Again, I'm not sure how it is going because she appears to have had a delayed reaction to the banana last week. It wasn't immediately, but her intestinal motility has been going downhill since the banana day. Today we are cleaning out the intestines again in hopes of being able to try a new food next week. I really, really need definite stevia results for Amber. It would make life here so much easier. (LEFT) After recital with two little stuffies from her daddy. (RIGHT-TOP) While Fred and I were at Barnes, Amber and Grandma made dinner at Grandma's house. Amber was proud of all she made. Thankfully Amber has a followup with the dietician next week and I'm hoping she will look over the food log to help me determine if it truly was the banana that caused the latest bout of constipation. On the positive side Amber is only having discomfort from the mild constipation. It looks like the new diet is allowing the inflammation in her intestines to heal. There hasn't been any pain for a few weeks now. On the negative side, I've got about 8 ripe bananas waiting for me to make low fructose banana bread that it appears only Fred and I will be eating. We are having a quiet day at home today waiting for another 3-5 inches of expected snow tonight. Amber is excited for a chance to play in the snow tomorrow. I'm excited for a reason that I have to stay home two days in a row. Excepting those curriculum reviews, I probably won't have much to say for a couple of weeks. So we wish everyone a Merry Christmas! Wishing you & your family a Merry Christmas too! What a lovely week. I think Amber looks great in both costumes. I am glad she felt well enough to dance. It is amazing how much school she has gotten through. 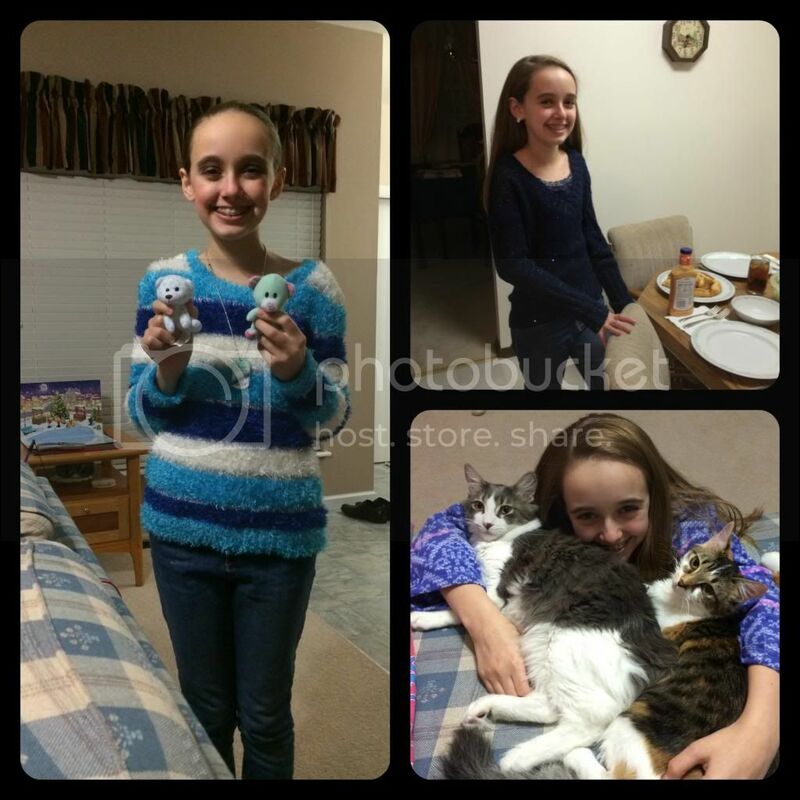 It sounds and looks like Amber had a great week! She makes a lovely little dancer! She looks so happy and healthy! She so deserves to feel good and have fun after going through so much. great idea on the bowling party!! Looks like slow but steady progress for Amber. Any stability in health is a good thing. I am glad that you are starting to find a food routine that works. We will keep praying for improvement. I also like the bowling. We bowled a couple of times over summer with some kids bowl free deal. We have another week before we break for Christmas. Amber always looks so happy in her pictures. Keilee and I pray for her and you every night. I am glad she is doing better. Thank you SO much for the Christmas card. We were so excited to get it! Merry Christmas Christy, and give Amber a hug from us both.